The Job Plan map canvas, showing both automatic and manual steps in a pipeline. 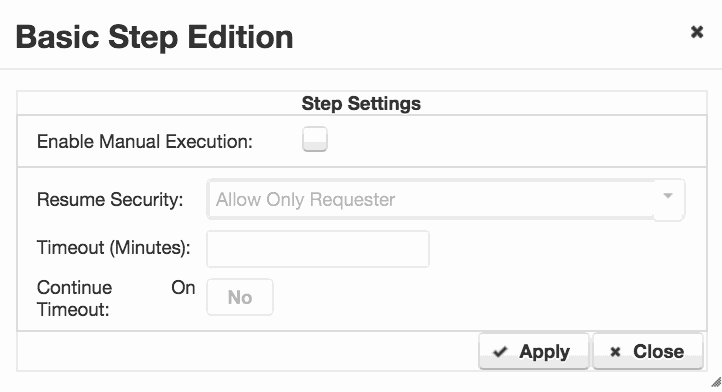 You can configure a pipeline step to be manual, by selecting ‘Steps’ -> ‘Add New Step’ from the Pipeline task bar. Available steps dependes on installed plugins. Choose the manual step type from the drop-down list. The dialog is shown to the right. Click on ‘Enable Manual Execution‘ to turn this step into a manual step. You can choose from the drop list of options who can resume the job, which can either be the requester, or the requester and a member of the group chosen from the droplist. On the ‘Project’ -> ‘Orchestration’ tab, a new task can be added by highlighting the task immediately before the required manual step, and clicking ‘Add Task‘. 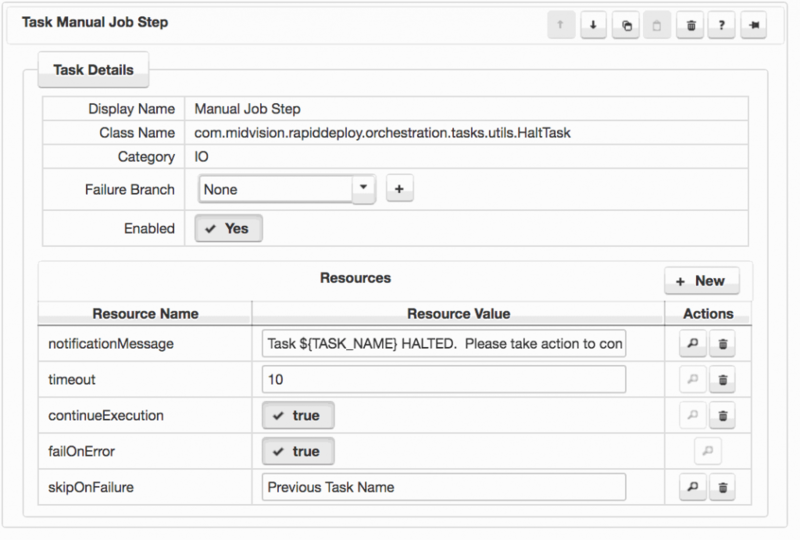 You can add a ‘Manual Job Step‘ anywhere in your Project Orchestration Model. You can find this task under ‘IO‘ Category when selecting from the task palette. When the Orchestration execution on the target encounters the manual step task, an email is sent to registered recipients with the notificationMessage. The job is halted on the target until the timeout time is reached, or the deployment is resumed from the RapidDeploy running jobs panel. If the timeout is reached, the job either contiues or fails, depending on the continueExecution setting. You can resume the task flow in the ‘Running Jobs‘ panel by selecting the ‘Play‘ button next to the halted job. You can see an example of this for a Project Orchestration Model Manual Step in the picture . RapidDeploy comes preconfigured with four environment types, Unknown, Development, Test and Production. All targets belong to an Environment Type. Further environment types can be created by a user with the correct permissions. User groups can be associated with environment types. For example the ‘Prod Approver’ group could be associated with the ‘Production‘ environment type. When a group is associated with an environment type, at least one user from each such group must approve a job, before it can be authorized for deployment into any target belonging to that environment type. A red ‘Approval’ gate is shown in the job plan. In the image to the right, you can see an in progress job plan waiting for an approval.